While the quote, "You are what you eat" may be an overstatement, it is, in fact, true that we are greatly influenced by what we eat. Food impacts our general physical health, our energy, our cognitive process, our mood... Poor eating choices, over time, are implicated in several chronic conditions and disease processes (e.g., diabetes, heart disease, dementia, mood disorders, cancer, etc.). Sleep and exercise play a role in these processes too, but that is a conversation for another day. Suffice it to say, here, aim to get 8 hours of sleep each night and exercise daily. 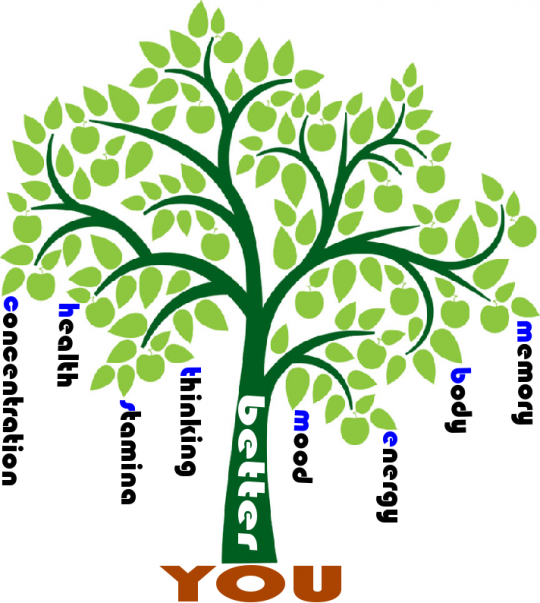 Keep in mind that by minimizing your stress, eating the right foods, getting good exercise and sleep... you will actually induce neuroplasticity and neurogenesis (e.g., grow new brain cells!) -- this is not just good for learning, memory, etc. but is also important to healing and mental/physical health. Food contains macronutrients and micronutrients. Macronutrients = carbohydrates (the body's primary energy source), fats (what the brain craves), protein (includes the 22 amino acids). Carbohydrates (starches, sugar, and fiber) come in two forms: complex and simple. Foods like whole wheat pasta and veggies contain complex carbohydrates. The best carbohydrates are micronutrient-dense whole foods that contain sugars or starches along with fiber (e.g., whole fruit, winter squash, beans, quinoa). Protein is the building block responsible for the growth and maintenance of our eyes, hair, skin, nails, organs, and muscle; and proteins do a lot of work, more generally, throughout the body. We must get 9 of the 22 amino acids that make up proteins from food sources. These are called the essential amino acids. Some foods (e.g., those that come from animal sources, like eggs) have all 9, but you can combine incomplete protein sources (like brown rice and black beans) to get all 9 too. Fats are a necessary part of a healthy diet and serve as a great energy source for the brain. Fats that contain fiber, beneficial micronutrients, and phytonutrients are excellent choices (e.g., nuts, seeds, dark chocolate, olives, coconut, avocados). Micronutrients = vitamins and minerals. Vitamins are essential to energy production, immune function, blood clotting, brain development, and a whole host of other fuctions. Minerals are important to bone health, fluid balance, growth, and several other processes. Our bodies do not produce most vitamins and minerals; we must get them, largely, from our food. There is a lot of controversy about the correct proportion of macronutrients we should be eating. What we need actually varies by age, lifestyle, gender, health status and health goals. The low-carb diet (e.g., see Atkins and Paleo diets) is focused on protein and fats and keeping carbohydrates to a minimum. Vegan diets (e.g., see Joel Fuhrman) tend to be dense in nutrient rich veggies and fruits and are thus higher in carbohydrates, and de-emphasize the importance of seeking protein outside of plants. The Mediterranean diet is fairly balanced with healthy fats (think avocado and olives), proteins mostly from fish or chicken, and carbohydrates from grains and veggies. Which one has the lock on the truth? Well.... the truth is that there is no single truth. The right way of eating is the one that YOU choose so long as it is sensible and balanced and focused on getting you a good array of micronutrients and keeping "junk food" to a minimum. We'll give some general guiding principles below. Keep in mind that in Humboldt county most of us have a vitamin D deficiency, so this vitamin is a good one to take as a supplement for just about everyone. Vegans and vegetarians, in particular, may want to supplement by taking B12, D3, and DHA/EPA Omega 3 fats. Incidentally, the Mediterranean Diet (which has a nice balance of the macronutrients) has a lot of research to back it up. Seven studies have shown that it decreased mortality, cardiovascular and cancer incidence, and neurodegenerative disease (see Am J Clin Nutr 2010; 92(5): 1189-96). Specific studies have shown that it reduced stroke risk, blood pressure, diabetes risk, heart attack and that it improved memory scores and reduced the risk of depression (e.g., see JAMA Intern Med 2015; 175(7): 1094-1103). You can also read more about this diet and the research backing it at the Mayo Clinic website. 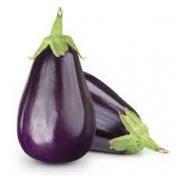 Foods that Mediterranean, Paleo, and Vegan diets ALL recommend: nuts, seeds, fruits, veggies, olive oil. All three lifestyle choices can be healthy when following the principles below. In general: the bulk of your diet should consist of WHOLE FOODS: fruits, vegetables, grains (mostly whole), olive oil, beans, nuts, legumes, seeds, herbs and spices. The base of every meal should be focused on these foods. 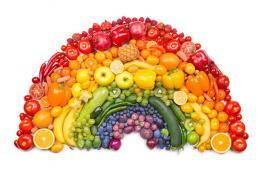 Eat a rainbow of colors at your meals. For those that choose to eat animal products, aim to eat fish and seafood twice per week (more is okay too); and poultry, eggs, cheese, and yogurt should generally be eaten less often (think of them as an accessory). Eat meat and desserts more rarely. Wine (yup, it's true, choose red) is okay in moderation for most people (a few times a week) and drink plenty of water during the day. Also, for your health: exercise, sleep, socialize. Drink 1/3 to 1/2 your body weight in pounds in ounces of water every day. (Why the range? It depends on who you are listening to. The experts' advice generally falls into this range). So, if you are 200 pounds, this would mean drinking up to 100 oz. of water. Avoid "white" or "clear" processed products (note, we are not talking about water, fruits, veggies, legumes...). In general: avoid white flour, milk, white sugar, clear honey, clear apple juice, clear hydrogenated oils, etc. Avoid food that requires a label, but when you do eat something from a box or bag, the list of ingredients should be no longer than 5 or so ingredients. If there is an ingredient on the label that you cannot pronounce, the food is probably bad for you. Mark Hyman labels many such consumables, "food like substances" as they have been processed and supplemented to such a degree that they are barely recognizable as food at the point at which they make it into a container and find their way onto a shelf. Again, eat foods that "go bad" such as fruits and vegetables. Foods with a long shelf life can be harmful to your body. Generally, eat foods that existed on the planet 10,000 years ago-- foods that were not engineered. If you eat fish, be mindful of where they came from. Our rivers and lakes tend to be contaminated with mercury, and large fish, in particular (swordfish, tuna, halibut, Chilean sea bass, etc.) are prone to mercury burden-- try to avoid. SMASH fish tend to be the best for you. SMASH fish = salmon, mackerel, anchovies, sardines, herring. These fish are high in Omega 3 fats as well as vitamin D, B12, iodine, and selenium. Shellfish like shrimp, scallops, oysters and mussels are also fine. Foods packaged in glass are better than foods packaged in other ways as toxins from cans or plastics can leech into the product over time (the longer it has been sitting on a shelf). Packaging matters less with foods/drinks that are popular and tend to fly off the shelf since these do not have a chance to sit long enough for the leeching process to occur. Choose "certified organic" and "locally farmed" whenever you can. Avoid over-consumption of commercial products. These are the fruits and veggies known as the "dirty dozen" that are most prone to having pesticides (buy organic whenever you can): strawberries, spinach, kale, nectarines, apples, grapes, peaches, cherries, pears, tomatoes, celery, potatoes. Just a quick note: Curcumin, a curcuminoid that is found in Turmeric (but can also be found as a high quality supplement), is just as healthy as you've heard it is! There is a lot of research being done on this powerful antioxidant. It has been shown to selectively target and destroy the stem cells that cause cancer malignancy, reduce the risk of heart disease, reduce arthritis symptoms, help ward of depression, and possibly even help to treat Alzheimer's disease. To learn more, here is a link to a summary of findings. Make sure to get good fiber in your diet. For example, a piece of whole fruit gives you fiber and also slows down the absorption of sugar from the fruit, whereas the extracted fruit juice from that fruit gives you no fiber and will spike your blood glucose. It's not that fruit or vegetable juices are bad, just be sure to mix it up and include smoothies or whole fruit/veggies to your diet as well. Fiber is important for gut health and heart health! Include prebiotics and probiotics in your diet-- they are great for gut health (a healthy microbiome). Think: fermented foods (like sauerkraut, kimchi, kumbocha, kefir), yogurt [can be made from cow, goat, or coconut mik] with live culture, a baked potato that you let cool over night and then reheat (this actually turns the potato into a prebiotic food!). Include good fats in your diet: avocados, nuts, seeds, extra virgin olive oil, grass fed butter or ghee, pasture raised eggs... Go for foods that have good quality fats (omega 3) and are low in refined omega 6 oils. Avoid unnecessary antibiotics; minimize alcohol, NSAIDS, smoking, red meat, hydrogenated oils, exposure to toxins, refined sugars and high glycemic diets (e.g., eating, with regularity, foods that spike your blood sugar). Some folks say you should also minimize gluten, but there is controversy around this and at present we don't have a stance on it. Food for thought: sugar is actually more addictive than cocaine! We are not advocating that you avoid it altogether, but use it as a treat, not a staple. Cooking methods matter: avoid overheating your oils (pay attention to their smoke point) & use veggie broth or butter as an alternative to oil some of the time, steam veggies rather than cooking them in water, keep the yolks in tact (not hard) when cooking your eggs (for better health benefits). In general, extra virgin olive oil, cocunut oil and butter or ghee are the best fats to cook with. In general, cooking with lower temperatures = the healthiest way to go. Veggies that should be eaten cooked, at least some of the time, to maximize their nutritional value: Broccoli, cauliflower, brussel sprouts, asparagus, spinach, kale, carrots, tomatoes, mushrooms, potatoes, legumes, zucchini, onions. Interestingly, when you cook veggies, you lose some nutrients, but others become more available for your body to use (e.g., beta-carotene, lutein, lycopene, calcium...) and cooked veggies are more digestible to the body. Veggies that should be eaten raw sometimes: bell peppers (green, red, yellow, or orange), broccoli, onions, garlic. Overall, eat a colorful array of veggies and fruits. A combination of raw and cooked is the way to go! Eat mindfully-- eat slowly and pay attention. Eliminate distractions. Pay attention to your body's cues that indicate hunger and fullness. When we eat mindfully, we tend to make better choices, stop eating when we are full, and enjoy our food so much more! The Center for Mind-Body Medicine offers great training in "Mind, Mood, and Food" and "Food as Medicine" a couple of times a year in different locations.